Sudeep D'Souza: What rediff will do for money ? 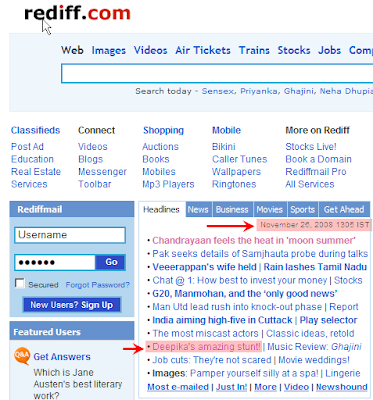 What rediff will do for money ? I came across an article in Rediff about "Deepika's unbelievable stunt!" and I was curious and clicked on it and got to watch the following video which is a combination of 3 images. I apologize for the bad quality of the video. This video is so fake that I could not believe the editors did not even notice it. If you break up the images that comprise the video it becomes very apparent and I will let the images do the talking. The text below these images clearly shows no body is reviewing what is being put up or Rediff will just publish anything as long as they get paid. I took two screen shots - one on Nov 26, 2008 @ 1:05 PM in which there was a link to the above farce and I then took a second screen shot on Nov 26, 2008 @ 2:50 PM and the link was not there. I searched all over for it but no luck it was taken off - but the original link to the post is still there so you can click on top and go see the post. Can we really trust any of the news sources out there and their opinions? Thats too bad, true, as long as they get paid, who cares attitude..
Rediff has degraded over the years..... i used to like their editorials once upon a time and they used to have good people writing too....Now its just a lot of SEO based news. Sad....Indian media is the pits...be it the TV or the internet. Why don't you Blog ?